I used to watch Aileen Belknap walk in to church with her nose and shoulders up, wearing all white with clean white socks as mittens on her tiny hands. I’m sure she was pretending they were satin gloves. And on the way home, as my family would walk behind hers, I would consider the pumpkins. 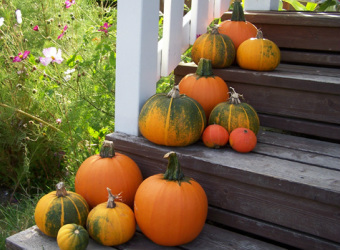 December, March, August there’d be a pumpkin or two—new ones every couple of weeks—sitting like growled-out orange watchdogs lying in the uncut grass. At Halloween, none of them would be carved like jack-o-lanterns but they’d still be sitting there, docile and plump under the streetlamps, and when I would go trick-or-treating with Samantha she’d ask me questions about them: why they were there, what they looked like, where they got them. Of course I didn’t know, and I would come up with different descriptions, saying they looked like painted pregnant bellies or like gigantic orange light bulbs. We imagined things together and I think we both enjoyed the mystery more than the thought of actually knowing the truth. The first time I spoke to Aileen at school she was doing a word problem in our math class; it was the only class we’d ever had together. I made my way over to the pencil sharpener, stuck mine in, twirled the knob, and peaked over at her faultless handwriting while hearing the sharpener wind almost silently around my pencil which was as pointy as it could get. “Do you need help?” I asked her. She looked at me as though she was insulted that I assumed she might not be able to do something. I added, “I’m just asking because I just finished and could just, you know, just give you some tips.” The line was stupid and obvious, but came out so easily and naturally that I was surprised. Generally, my voice stutters when I say something genuine, something true. It’s when I lie that I sound trustworthy. “I think I’m okay,” she said, letting her raised eyebrows utter a thank you. “Well, you’re welcome anyway,” I said. She made a point of not looking at me in a way that let me know our conversation was over. He was tossing pebbles at the swing-set where younger kids were playing, and I was drawing on the sidewalk with my pencil. I didn’t respond. We were eleven, and hormones had yet to fully settle in, which made our conversations about girls as juvenile as male dirty talk can get. Still, my friends and I all knew that being hot was the only redemptive quality of a person as strange as Aileen. “I think she likes me,” I said. I had thought about possible tactics—though I wasn’t sure exactly what I was after. I came up with possible lines or proposals or invitations. Though my attempt to offer mathematical advice hadn’t worked out with her, I still thought I could come up with something. I was inexperienced though, of course, and good ideas for talking to girls weren’t easy. That afternoon, I went to my father for advice, wanting to hear what he had to offer. But also, I wanted him to have to recall what it was about Mom he loved. Every day that year my chores were to read to my sister and hose down the tree-house Dad had built for me which was infested with roaches. The exterminator had come by at the beginning of the school-year and had sprayed every dilapidated inch of the thing. I had begged for Dad to build it, but was almost glad it was uninhabitable: the thing was unsanded and so splintery I was afraid to touch anything without workmen’s gloves, not to mention that the boards were loose and the ceiling was too short even for me—an undersized fourth-grader. But the bugs made it worthwhile. I would shoot the hose in through the cracks of the peeling wood and would vocalize sounds to emulate the voices that the fleeing roaches would make if something that small could make any audible sound at all. He was always home now, after losing his job at a grocery store—an occupation I once believed to be impressive. He was lying on the couch that afternoon in the living room watching a talk show that came on before cartoons. His eyes were dark like the half-chewed cigars he smoked, and his cheeks were always red as if he had just gotten back from the beach without wearing the sunscreen Mom always reminded him about. I was puzzled and actually scratched my head. “No, I would m—” he trailed off. She wasn’t home of course and before she came home that day I went to the backyard, sat on the grass, and looked overhead, through a lattice of magnolia tree limbs from our yard and watched squirrels shimmy up the tree shafts after one another. I wondered if they mated for life. It was one of the first times I remember wondering about an animal without wanting to disremember it. When I thought Dad might be checking how I was doing on my chores I went to the hose, loosened the rusty screw and watched the water surge outward up to the tree-house. I put an old flower pot on my head and pretended to be a fireman putting out the roach-ridden abode. When the lip of the pot covered my eyes I only listened to the tinny spray of the water on the wood and felt momentarily not like a fireman but like a soldier shutting his eyes as part of a firing squad. My sister’s room was clean and pink and dim, and since childhood I always associated cleanliness with one’s lack of normality, and designated pink as a color for the blind. Dad believed in saving electricity because Sam couldn’t see. “Why bother keeping the lights on?” he would say. He and Mom had had an argument about it one day and I could hear Mom telling him that it was horrible to think of their daughter that way; it made Sam seem like a prisoner to be locked up without light, she said. She can’t see any light so what the hell does it matter? Dad said. Then he offered the suggestion of asking Sam what she thought. Mom tried to keep the argument contained, but before she could he had bounded past my room and into hers—the door flung open with the sound of an amplified fly-swatter. “It doesn’t matter to me,” my sister said. And so her room stayed dark. When I read to her she would look out the window. Her blind eyes were frosted over, making them a dull blue that always made mine water, thinking that if she just wiped them with her fingers maybe they’d be functional. Our reading time began as a way for my parents to kill two birds with one stone: I practiced my literacy and Sam was kept occupied. TV and drawing, not to mention books or puzzles or board games, weren’t after-school options for her of course. At least one parent had to be present to help her do her schoolwork and since Mom had started returning late from her job and Dad was becoming increasingly irritable since he’d been fired, the task of watching after Sam fell to me. We read books about princesses and castles, and she would pretend to be Rapunzel. When she tired of that she had me read her the books from my English class that I would’ve ignored all afternoon anyway. “No,” I said quickly, sounding perfectly in-control. She lolled her head around as though she were digesting the scenery of our yard. The way she looked out windows always made me have a respect for her that I didn’t have for anyone else. She nodded and kept her face pointed toward the window. I wondered what she was thinking. She wasn’t listening to me anymore, though. I looked to the window, to the magnolia trees, the honeysuckle blossoms—all the things I could view so easily but had no appreciation for though I knew I should’ve felt lucky. I added, “I think they fight because that’s, like, you know, part of being in love.” She moved her head toward me and I moved my eyes down to the book. “They’re still in love though, I think. Right?” I said. But she still wasn’t listening, and if she was she wouldn’t know what I was talking about. Of course I didn’t even know. When Mom came home I was color-penciling the outlines to some sketches I had drawn of Aileen. I didn’t want it to look like her—or like any girl—and so I only drew parts: lips, hair, eyelashes. And the things I couldn’t remember, I made up. When Mom came in and looked at them she told me I had a good eye for drawing insects. She was washing the dishes from the day before when I came to ask her for advice on women. Her forehead was silver with sweat and the sun going down, and she wore rubber gloves that were a radioactive yellow. “Hm,” I said, not knowing what else to say. Things clattered in the sink. Dad said something from the other room which, under the noise from the dishes, was inaudible. “Where did you two go?” I asked. I had been trying to take a seat on top of the tile counter top by the sink where she used to set me when I was younger. But at that time, at age eleven, I was too small and awkward to do it by myself. I stuck myself in the crook between a cupboard and the refrigerator and looked up at her, waiting for an answer, hearing the groaning of the garbage disposal near my head. The way she emphasized certain words, letting the syllables shift in volume and key, was embarrassing. “Don’t make fun of me.” I said. “I’ve got to do some homework,” I said, beginning to move away. She turned the garbage disposal off as I was leaving. “Oh just hush,” she called. “Just shut the hell up,” she said before I shut my door and muted them. The next day, Aileen was pristine, wearing white as usual. Her blonde hair was spun in a swirl on top of her head like soft-serve ice cream. We were studying storytelling and every day that month our teacher would read us a short story. We were to go home every day and read a similar one from our books to our parents. This was the story I always read to Sam. That day we were told a story of a frog who hops back and forth between his work at the docks during the day and to his home at the pond where he sits on lily-pads. He gets in an argument with a town of fish who tell him that his ribbitting is waking up their children. He says something to the effect of, “Fish don’t sleep—you always have to move.” Time goes by and the frog and the fish still can’t get along. One day though, the frog is married and his wife has a litter of minnows that swim through the pond. When the fish eat a few of them the frog is sad. He tries to complain to the fish mayor or something who just says that no one has gotten any sleep in the pond for the last two years and now they are all very, very angry. I forget whether or not things got patched up or if the frog repents or moves to some other area of the swamp. All I remember is watching Aileen as tears formed in her eyes when we got to the part about the minnows being eaten. When the story was over and our teacher asked the silent room what the moral of the story was I heard nothing except a slight sniffle coming from the little woman wearing white who was huddled into herself at her desk. When everyone looked over she pretended to be on the verge of sneezing. Recess was windy and her usually-perfect hair was disheveled. When I came over she was sitting on a bench under an oak tree with her legs crossed and her hair hurricaning upward. “That was a pretty sad story, huh?” I said to her. Sadness seemed like a topic that would make me look sensitive—that seemed like something girls should have liked. She had rows of what I later came to understand were pastel crayons. Blues and pinks and soft greens—colors that reminded me of Easter. “So did you like the story?” I asked. “I wasn’t paying attention,” she said. Her hair was flying around her and she didn’t seem to mind. I couldn’t find anything else to say and I didn’t feel it would help my cause to call her out for having cried during the reading of the story. Rather than say nothing, which wouldn’t have been a bad choice, I said, “Do you like pumpkins? Because I was thinking—” I started to continue. Suddenly she screeched, “Leave me alone!” and rushed off leaving her notebook and pastels behind. I saw a ladybug crawling over the table she’d be sitting at and flicked it across the table. I started to pick up her things to take over to her but thought it better to leave her alone for the time. I looked over the notebook and saw a glossy pastel portrait she had begun of a frog sitting atop a circular lily-pad talking with a pinkish fish beneath. The beginnings of a smile had been sketched on both the creatures’ faces and I remember thinking something about how the worlds above the surface and below the surface should have been able to work things out. For the rest of recess I spotted her with a few other girls that she was only peripherally friends with—no one was really friends with Aileen Belknap. The girls played some game with dancing and hand-holding where one person stood in the center singing or screaming or something. Since I was a boy I didn’t have the gumption to go over and try to talk around an intimidating female audience—not even for Aileen. Until we were called to go back into the school I listened to the girlish shouts splashing through the windy blacktop toward me as I sat on the swings—letting Joshua throw pebbles at me—watching Aileen like a bright white wick in the center of dizzy circle. I didn’t speak to Aileen for several days out of embarrassment—both mine and what I assumed should have been hers. I didn’t look at her in class long enough to grab eye-contact but I couldn’t stop looking at her posture, her primness, the flawless way she carried herself even when she was simply sitting down. When I was walking home one day she was about a block ahead of me. I tried to slow down to avoid interaction but with each passing street I seemed to be gaining ground. I realized she was trying to make our paths intersect. It was a warmer day, one in which I actually saw butterflies—something I never took the time to notice until then, when I was trying to slow my pace. The trees in the yards were fragrant, filled with flowery scents. Rows of honeysuckle vines ran up to several houses, which I felt I’d never seen, as though a cord of honeysuckle weaved in and out of every home between mine and school in a strange way connected all of us. “It’s okay,” Aileen called back to me when I was only fifty or so feet behind her. I wasn’t sure if she was forgiving me for my intrusion at recess or letting me know it was okay to walk alongside her. “I’m sorry. I mean, yeah. It’s okay,” is something like what I said. “I know it’s okay. I just said that.” She was at a corner with a hand on her hip. She seemed too proper to be carrying her own school supplies and though I’d never seen her converse with someone for longer than twenty seconds I guess I thought someone should’ve been chauffeuring her around. “Why’d you ask then?” I said. All I had seen really was an image of what looked like two frogs kissing. Figuring that someone as immaculately put together as her wouldn’t take that on as a subject, I said no. We walked a few more feet and our elbows clanked. She walked on with quick but deliberate steps. “Can I see something you drew?” she asked. She seemed to want to know not out of curiosity but to get even—as though I’d seen her naked and now she deserved the same voyeuristic rite. “What does?” she asked looking around. I couldn’t say that it was her I drew. “Bugs, I guess. I mean, I guess bugs. Yeah.” I saw a butterfly float by in the ungraceful way they do. “Certain bugs. Like butterflies,” I said. “Of course,” I said quickly. “Do you ever think about it?” she asked. She started walking rapidly but I didn’t stay behind. “I didn’t say you did,” I said. “I don’t want to kiss you,” she said. “Why are you talking about it?” I asked. I had hardly ever thought about kissing, except for that I’d like to kiss her. And that was just the wanting of the kiss, not the doing of it. “No,” I said with so little pause that I was sure I sounded unconvincing to her. I didn’t realize we were in front of her house until she began stepping up her driveway. I wanted to say something, but I knew anything I said would just taint what we had exchanged. Before she walked inside she smiled at me and told me to leave, but that she’d see me later. When the door closed and I started to walk off I saw a ladybug fly off one of the pumpkins in the yard. I thought about possibly going over to grab it, but for whatever reason just walked away. That afternoon, I went home trying to find one of the butterflies that had seemed so bountiful earlier. But none came. By the time I finally caught one it seemed too precious to destroy. I put it underneath a crystal glass and hid it in my dresser. When I woke up the next morning it was still. I cried and what was even more disturbing than its death was the fact that I cared. The next day—the day I kissed Aileen Belknap—was also the day I thought I might never see my mother again. Mom and Dad had an argument about the sprinklers when I woke up. Mom was buttoning up a pantsuit and Dad was sitting down in his pajamas with little snowflakes on them; he had bought matching pairs for the three of us—him, me and Sam. Sam was crying in her room. Dad was spooning cereal into his mouth like a rusty forklift—his fingers trembling with each little movement. Mom’s movements through the kitchen were breezy and she went smoothly between the stove and making my plate. Her hair was packed behind her head in a bun and she seemed to be concentrating on twenty tasks at once. She was talking loudly to Dad about the sprinklers and to punctuate every other sentence of hers he would yell something with words I wasn’t supposed to say. I wondered why parents seemed to want to hide words like those from kids who just picked them up eventually—whether we decide to use them or not, we still hear. You can’t keep secrets from children for too long. The sun was knocking against the pane; it felt out of place, like a neighbor you wish would go away. Dad kept looking at it and then at me as though he expected me to yell at Mom too. I’d never heard them talk about sprinklers before—certainly not with as much anger. Mom was talking as rapidly as she was moving around. She set a plate of eggs, bacon and a blueberry muffin in front of me while packing up her leather briefcase. “That brown briefcase doesn’t match your goddamn black suit,” Dad said as a few quiet moments passed. I pushed the toast around on my plate and could hear Sam bellowing like a siren in the background. “Don’t talk like that in front of your kids, Veronica” he said. He sipped the milk out of his bowl in a way that disgusted everyone in the family except him. His eyes were low and when he set the bowl down milk melted into his dark stubble, turning it grey. Mom looked at him as though she wanted to cuss, but looked at me instead—a touchstone, a reason, an excuse—to keep from getting involved in the topic anymore. Dad picked up a grapefruit from the bowl on the table. Mom shut the door and when it snapped shut he threw the fruit at it as it split through the glass frame with a quick and quiet crash. He picked up the bowl and tossed it too. It popped off the door. It was plastic. There was no milk to make a mess with as it hit the tiles on the floor. Outside, on the other side of the peephole Dad had just made with the grapefruit, I could hear my mother utter a few syllables. She was so far away her voice almost seemed inflected with deep emotion. She was probably cussing—to herself or at him—but I imagined maybe she was saying sorry, although I didn’t know what she had to be sorry for. When we heard her car pull off to work, Dad walked to the door to look where the grapefruit had swished through the glass. He picked up the bowl, opened the door, walked outside, and returned after a few seconds with the fruit in his hand. He set them both in the dishwasher—his movements as slow and lethargic as a zombie’s. Then he went back and took out the fruit, realizing momentarily that he’d done something wrong. As he started to walk away he cut his foot on a piece of glass from the window pane. He sat down Indian-style in his pajamas and after he dug the tiny piece out of his bare foot. I imagined him thinking like a robot—imagined that maybe his gears were clanging together or he needed a new chip inserted. Something buoyed him back into consciousness though. “Just don’t go over there for a while. Okay? Do you think you’re mother’s coming back tonight? Look. Forget it. Don’t go over there. I’ll deal with it later. Did I say that? I’ll deal with it later. Just, um, just—” but never finished his sentence. That day we walked home on our same paths. She had been staying a block or so in front of me the whole time—looking back every so often, awkwardly making sure I was there. It made me feel like a stalker. Eventually she had to stop at a red light and I gained some ground. I slowed down to give her her space but even when the light turned green she stood there still. She looked back at me again and I pretended to be in awe of the gorgeous walk I took for granted every day. “Just come here,” she called after the light had gone through its cycle and had turned red again. I started to walk off but the light was still red. A car whizzed by and her hair swoomed upward like a visual shout, exclamating from her scalp. I couldn’t look at her, and so I watched a bee swing around my face and land on the ground. I thought about stepping on it but I couldn’t get myself to move. I expected there to be tears in her eyes but a girl like that wouldn’t cry in front of you. She’d yell maybe or maybe just ignore you. But the power inside of a girl that tiny doesn’t come out in tears. “You wanted to kiss me,” she said. “No,” I repeated. My voice was resolved but I think the repetition of the brief line gave my lie away. Before I could think about anything except to notice the bee buzz through the air and past both our faces, her lips were on mine. It had the texture of old, softened sandpaper and tasting of little girls’ banana lip-gloss. When it was over I felt she had told me a secret—but not one I had asked to know. I shrugged, trying to play it cool although I was too confused to pretend. “Why do you want to taste like bananas?” I asked. A car went by and she kept a hand on top of her head this time, keeping her hairdo place. Her eyes seemed to flutter in an even rhythm with the wind that rapped at her hair, as it rustled the swarming luster of her hair the color of artificial honey. “What did you expect it to taste like?” she said. I thought about all the flavors in the world. Strawberry and blueberry, chocolate cake and squash, pizza and root beer. We never kissed again but after that afternoon I noticed at recess every day that she put on some lip-gloss—always colored orange—and I liked to think it tasted like pumpkins. When I came home that day the grass was wet from Dad getting the sprinklers working, and when I went around to the backyard I saw him listening to the radio outside. There was baseball game on and someone had struck out when I walked up. He was dressed in his pajamas and his eyes were as red as his cheeks. “What’s going on, bud?” he said to me. I shrugged my shoulders and tiptoed around the back porch. “Your mother took some of her things,” he said. I nodded and started to move back toward the front of the house, as though I’d come to the wrong home by accident. He was probably drinking and wouldn’t remember the next day. But he called out to me and I was trapped out in the open of the wet grass. “Did you do your chores?” he asked. He nodded and pointed his finger at me flagrantly. “Right, right,” he said as though just remembering an old anecdote. He gave a chuckle punctuated by a hiccup, and then a deep burp. “I’ll start on ‘em now,” I said. “Oh yeah. Those goddamn bugs. Jesus.” He got up quickly and his pajamas shimmied on his shoulders looking too big for him momentarily. Some papers I hadn’t noticed on the table fluttered up like escaping pigeons. He didn’t give them a second thought. Before I could make a movement toward the hose he was already there spinning the knob. He took a long sip from the dangling spout before setting his thumb on the nozzle and then flinging the stream—like a blade—up toward the tree-house. I moved toward the deck and watched his movements—dancing through the yard, looking like a circus clown. He was more drunk than I had thought. I wished I could see Aileen, that I was on her property and not mine. I didn’t speak but he forced the conversation nonetheless. I stood over the letters and tried to collect the ones that had fallen off, many of which weren’t folded, nor signed, but they smelled of perfume and some of cologne, and they looked as old as worn-out skin. “She kept all of them,” he said again. He sprayed the tree-house more, and that was the first time I understood that spraying the thing probably didn’t get rid of any bug problem. When Mom and Dad started having more violent fights we’d had to go to a shrink. Dad was supposed to go too—that’s where the idea about trying to cry came from. The doctor said I should try to focus my anger somewhere else rather than on hurting animals. I guess now that it was about focusing on things like tree-houses and not animals. Dad sprayed the house and some of the water bounced back toward him and he let the water shed off of him in tiny wet shingles, drenching his snowflake pajamas slowly but fully. I started reading one of the notes. I didn’t know what had been its cause, but it was dated before I was born. It was not sad, just disappointing to think that after all that time so many problems couldn’t be resolved. I read through it, thinking about love, tasting Aileen’s banana lips on mine. I looked back up and saw that Dad was lying down in the grass—passed out, or tired, or maybe just sad. Before I went inside I watched the water flowing from the hose in his hand like smooth, clear blood. “I belong to you,” he said to nobody. Through the window in Sam’s room I watched Mom walk through the grass as she came home. Her shoes were off and she was carrying them in her hands as if she was coming home late from a party and wasn’t sober enough to walk in heels. She wobbled nonetheless. I started trying to find the book I was supposed to read. I scrambled through my backpack and Sam seemed to sense what I figured: that I had left it at school. Her head was pointed at the window and I looked out as well and saw Mom come toward the house. I expected Sam to ask me what was going to happen like she always did, and I didn’t want to have to lie. She didn’t ask. She didn’t ever again. When I heard the door close I began pretending to read. I told the story about the frog and the minnows but I changed it around a little. I spoke louder than I normally would, wanting to emphasize the illusion that I was actually doing what I was supposed to. Sam sat on her bed trying to write out little messages with her finger onto the sheets. She was petting the covers with her fingertips and I looked at her movements while I pretended to read. I noticed then that she was a few years older than when most kids learn the alphabet. She whirled her finger around, making little nonsensical signs and symbols as I told my jumbled version of the frog and his family. As we heard our parents talking downstairs Sam’s hand movements became more rapid and hard until they were almost violent. They way she was moving reminded me of how abstract painters might work—throwing their hands all over the place, communicating emotion without sense. The words she wrote were invisible but, I suspected, powerful. I watched the way her finger trailed around the bedspread, and I watched as though waiting for a message to reveal itself. Then I imagined they were hugging. Sam, who I thought hadn’t been paying attention the entire time said, “You better be a better artist than a writer.” I told her to shut up when I realized Mom and Dad had gone into one of their rooms. I sat with my sister on her bed for a while and I wondered what Aileen was doing. I was glad I hadn’t seen Mom and Dad. I hoped they had hugged. I hoped they would never leave each other. Sam stared toward the window and began writing on the glass with her pinky finger. Her hand was sweaty and made soft, streaky sounds when she moved it against the pane. After a few moments she stopped and moved her head over toward me. “So did you ever figure out why they have those pumpkins in front of their yard?” she asked me. It hadn’t even occurred to me to ask. I had completely forgotten. “No, she wouldn’t tell me,” I said quickly.